JC Mercer, the event organizer for the upcoming Oregon Bigfoot Festival, stops by to give Monster X Radio the low down on the event. We will also be announcing some big news! 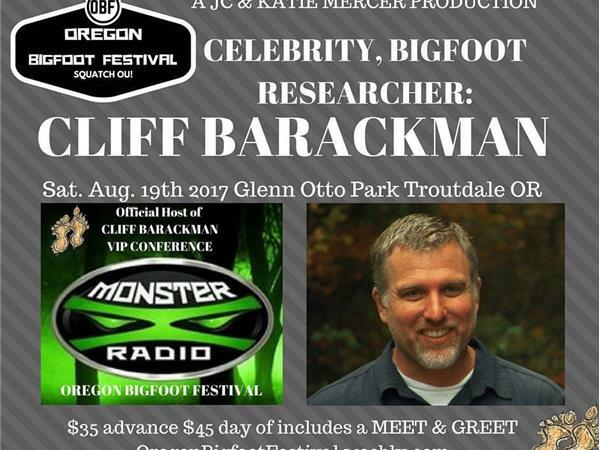 The Oregon Bigfoot Festival will be held at Glenn Otto Park in Troutdale Oregon on August 19th, 2017. There is a $5 suggested donation for admission for Adults, and $2 donation for Kids 12 & under. There will also be a Meet & Greet with Cliff Barackman, Bigfoot Researcher and star of Animal Planets Finding Bigfoot! Meet & Greet advanced tickets will be sold for $35, or $45 if purchased day of the event. This event promises to fun filled and as big as Bigfoot himself!